The thing is, when President Barack Obama—egged on by Secretary of State Hillary Clinton—called for an attack on Libya, the justification they offered was that Libyan leader Moammar Gadhafi would otherwise destroy Benghazi. So the fact that military intervention actually turned out to lead to the destruction of Benghazi seems like something you might want to tell Times readers, or Times consumers of multimedia, anyway. 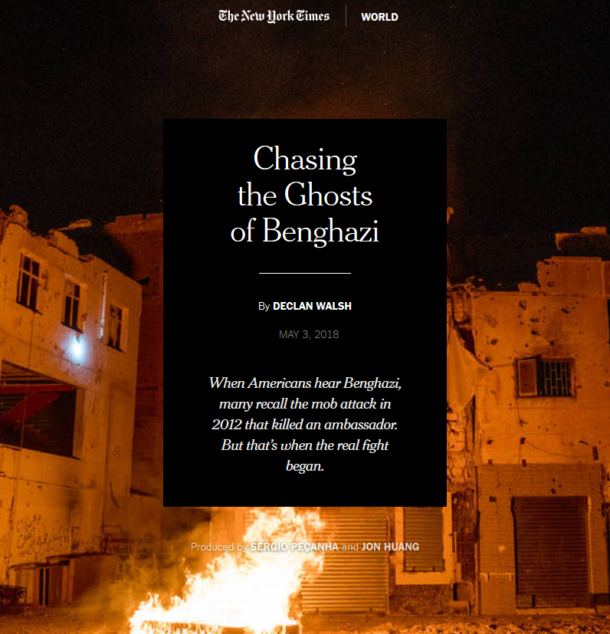 But Walsh, despite his stated objective, seemed to go out of his way to avoid talking about how Libya has come to be a place where major cities are turned to rubble. Here’s how the piece opens. When a “mob attack” killed the US ambassador in 2012—”that’s when the real fight began.” In other words, the “real fight” didn’t begin a year earlier, when NATO added its overwhelming military might to a rebel uprising against Gadhafi. “That shouldn’t be forgotten”—unlike the US destroying the government of Libya and leaving the nation to be fought over by warlords. – Fahad Bakkosh, who filmed the embassy disaster. This is not the first time US media, or the New York Times in particular, have erased US responsibility Libya’s travails. Ben Norton wrote a piece for FAIR (11/28/17) about coverage of the return of slave markets to Libya; the Times did better than most outlets by acknowledging that the resurgence of slavery was connected to the chaos following the downfall of Gadhafi—but couldn’t bring itself to remind readers that their own government helped bring about that downfall. But when a journalist sets out—”guided by one main question”—to understand the roots of devastating violence in a particular city, and fails so utterly to take the overwhelming role of Washington intervention into account…. Well, I’ve been doing this a long time, and I have to say I was startled by the complete erasure of quite recent, utterly relevant events. (*) Author: Jim Naureckas is the editor of FAIR.org, the website of Fairness & Accuracy In Reporting. Since 1990, he has edited Extra!, FAIR’s print publication, now a monthly newsletter. He is the co-author of Way Things Aren’t: Rush Limbaugh’s Reign of Error, and co-editor of The FAIR Reader: An Extra! Review of Press and Politics in the ’90s. Naureckas was born in Libertyville, Illinois, in 1964, and graduated from Stanford University in 1985 with a bachelor’s degree in political science. He has worked as an investigative reporter for the newspaper In These Times, where he covered the Iran/Contra scandal, and was managing editor of the Washington Report on the Hemisphere, a newsletter on Latin America. Since 1997 he has been married to Janine Jackson, FAIR’s program director. You can follow him on Twitter at @JNaureckas. Next Next post: Ethiopia’s leader: Old wine in new bottle?